WASHINGTON — As NASA starts to build up details about its plans to return humans to the moon, the agency is studying concepts for “human-class” lunar landers that would involve three-stage vehicles whose individual components could be flown on a range of launch vehicles. 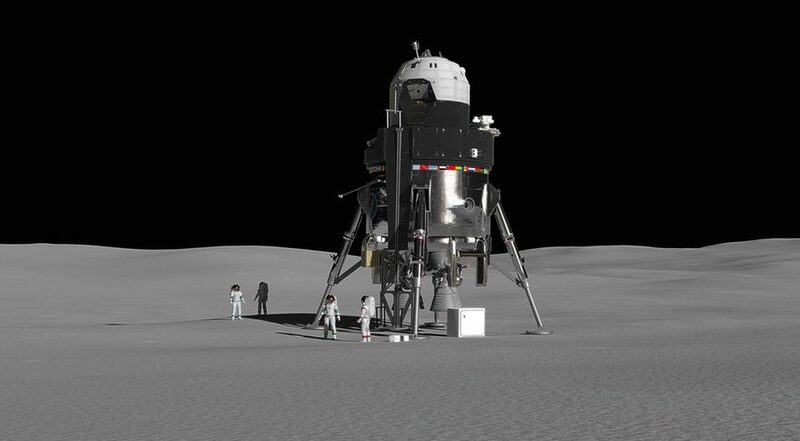 At a pair of meetings last week, agency officials said their examination of concepts for crewed lunar landers, still in their earliest stages, is part of three “swim lanes” for lunar landers that include small commercial and mid-sized science landers. In a presentation at a meeting of the Lunar Exploration Analysis Group (LEAG) Nov. 14 in Columbia, Maryland, Jason Crusan, head of NASA’s Advanced Exploration Systems division, said that NASA is reviewing past studies to determine the best approach for designing those human-class landers. “There are many different ways you can look at architectures for landings: single-stage, two-stage and three-stage landing options,” he said. The agency has been looking at past in-house studies of those architectures dating back decades, he said, along with outside reports prepared in the past. A two-stage approach, with an ascent module and descent stage, is more feasible, he said. However, the large mass of the descent stage, which he estimated to be between 32 and 38 metric tons, would be too large to be carried on commercial launch vehicles anticipated to be available in the next decade. “What’s interesting about this is that your per-element mass drops to 12 to 15 metric tons,” Crusan said. “This fits on a number of launch vehicles.” Those stages could also be co-manifested on SLS missions, while enabling more international partnership opportunities. “We’ve been studying these different implementation approaches, and are learning closer to the three-stage option,” he said. A synopsis for lander studies, issued in the summer then put on hold, will be reopened near the end of the year to solicit industry proposals for lander architecture studies. That approach runs counter to some industry concepts. In October, Lockheed Martin released its concept for a human-class lander that would be a large single-stage vehicle. That spacecraft would weigh 62 metric tons when fully fueled, but only 22 tons empty. Lockheed proposed fueling the lander at a fuel depot located in the vicinity of the Gateway, with the ability to eventually make use of propellants obtained from lunar ice. The work on human-class landers will be supported under a new budget line called Advanced Cislunar and Surface Capabilities included in the fiscal year 2019 budget proposal, which sought $116.5 million for the program. Congress has yet to pass a final fiscal year 2019 appropriations bill for NASA. Crusan said that NASA hopes to be able to test the descent stage of that human-class lander as a standalone robotic mission by 2024. That human-class lander work is one of three parallel strategies by NASA for getting to the surface of the moon. At the small end of payload capacity is the agency’s Commercial Lunar Payload Services program, where NASA will buy payload space on commercial lunar landers under development. NASA is evaluating CLPS proposals submitted last month. “We’re on track to award by the end of this year,” said Steve Clarke, deputy associate administrator for exploration in NASA’s Science Mission Directorate, at the LEAG meeting Nov. 14. Cremins, at the Users’ Advisory Group meeting, suggested that announcements could come by the end of November. In between CLPS and the human-class lander is a “mid-sized” lander for science missions capable of placing 300 to 500 kilograms on the lunar surface. Those landers, Clarke said, would have additional capabilities, such as direct-to-Earth communications, a lifetime on the surface of months and the ability to deliver, and later recharge, small rovers.